There are several things that increase our effectiveness in prayer: faith that believes God will do all He has promised; a spirit of praise that blesses God and inhibits the work of the enemy; and a holy life through which God can work unhindered. Imagine how formidable a prayer warrior with such qualities will be to our enemy. There are times in our lives for both feasting and fasting. We celebrate special occasions with special meals. Feasting however doesn't lend itself to serious prayer as does fasting. It is those times when we deny ourselves food that we find the heart and strength to pray with intensity. While there is no scriptural command to fast as there is for prayer, the Bible assumes we will fast because Matthew 6:16 talks about when we fast, not if we fast. 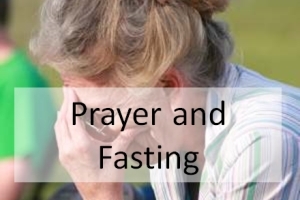 Fasting has been practiced by God's people throughout the ages and is often associated with sorrow over sin, times of national crisis, the need for revival, and times when special guidance or wisdom is needed. It is also used in preparation for missionary work. Fasting is hard on the flesh so it is usually easier not to do it. True fasting can only be done in our Lord's strength and not our own. We should never be legalistic about fasting or think of it as a duty. It is something we do out of love for our Lord and a longing to see Him exalted and adored by all peoples.